This was established as a farming community in the latter part of the 1800’s, when an English family (with the surname Pennington) settled here. Later, the sugar magnate, Sir Frank Reynolds, bought a country home here and then built inviting accommodation on the coast for the prime ministers of South Africa. Pennington is home to the charming coastal villages of Kelso, Sezela and Bazley Beach; which are laden in gorgeous subtropical vegetation and quaint homes. The balmy weather conditions extend almost all year round and KwaZulu-Natal is renowned for its hundreds of days of warm sunshine. This means that Pennington is an ideal destination for the beach holiday of a lifetime. The beaches here remain quiet, not noisy or overrun by tourists. Bazley Beach – the lagoon here is awesome for swimming, rafting and kayaking; making Bazley Beach a hotspot for adventurers and families with children alike. Ifafa Beach – a really beautiful beach, where the greenery is almost luminous and the white sands breath-taking. 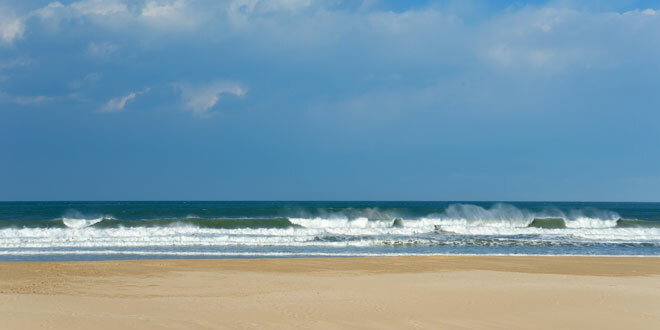 This is a lovely swimming beach, but is also popular amongst surfers and anglers. Kelso Beach – a favourite for surfers, thanks to its excellent swell, this beach also boasts a stunning coral reef, which is awesome to explore while snorkelling or SCUBA diving. Pennington Beach – the tidal pool is great for little ones and the wooden viewing deck makes for a fantastic spot from which to soak in the sunshine, drink in the views and savour an authentic South African sunset. Pennington is part of the Umdoni Coast, which is about 70 kilometres from the urban epicentre of Durban. Durban is a massive metropolis – full of malls, hotels, businesses and tourist attractions. It is also home to the King Shaka International Airport, where millions of international tourists begin their South African adventure every year. However, although Pennington is so close to this urban hub, it exudes a peace and serenity that is almost tangible. Pennington is a prime destination for those who love spending time on the water. In addition to deep-sea fishing, rock fishing, swimming and surfing, it is also fabulous for diving, canoeing, body boarding, kite surfing and hydrofoiling. Horse rides along the beach can be exhilarating or romantic, but always memorable. It is a hotspot for fishing, thanks to the massive variety of species on offer in these warm waters. These include rock salmon, shad, shark, kingfish, grunter, Garrick (leervis) and barracuda. Golf courses – there are the Umdoni and Selborne Park golf courses on offer for those that want to relax on the fairways and greens of KZN. Umdoni Park – this park boasts a number of walking trails, and is home to the Komba Bird Sanctuary, Nkumbane Dam, and a plant nursery. Oribi Gorge is just over an hour’s drive from Pennington and offers fabulous white water rafting, abseiling, ziplining and bird watching.